Intervision : what is it about ? Intervision is a ‘peer coaching’ activity with a small group of professionals or managers who have a professional context or challenge in common. Often other terms like peer learning, peer assist, group supervision, etc... are used. The term Intervision emphasizes the multilateral exchange between colleagues as opposed to supervision. 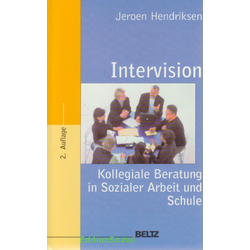 Within the intervision format, you can use several methodologies such as : incident method, roleplay, fishbowl, open chair, storytelling, etc... You can use a process facilitator, or function as a self managing group. Intervision : Why would you use it ? 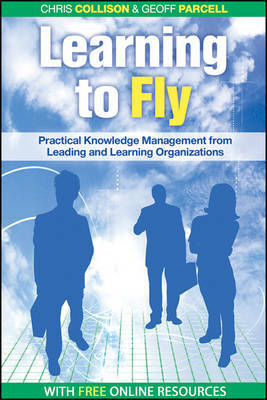 Learning and innovating in an organization is only possible if professionals have the feeling to belong to the same 'club' and when they feel connected to other professionals and are thinking of their work as a contribution to a common purpose and not focus on their particular intrests. HOW CAN I CONTRIBUTE needs to be the primary guideline for their priorities. And in order to get there a few elements are important : dear to challenge each other, put expertise together and share openly in order to come to better solutions, know what is important for your internal customers and suppliers, keep an open mind for other ideas, and ways to look at things.. The diversity in experience, perspective and role of the participants, allow individual participants to look at their reality defferently and allows for them to think out of the box. Intervision is one of the triggers for a collaborative culture where people feel collectively responsible for the organizations and want to contribute to organizational and business performance. It helps the transversal and horizontal integration and fortifies the internal customer / supplier links. Intervision : when to use it ? 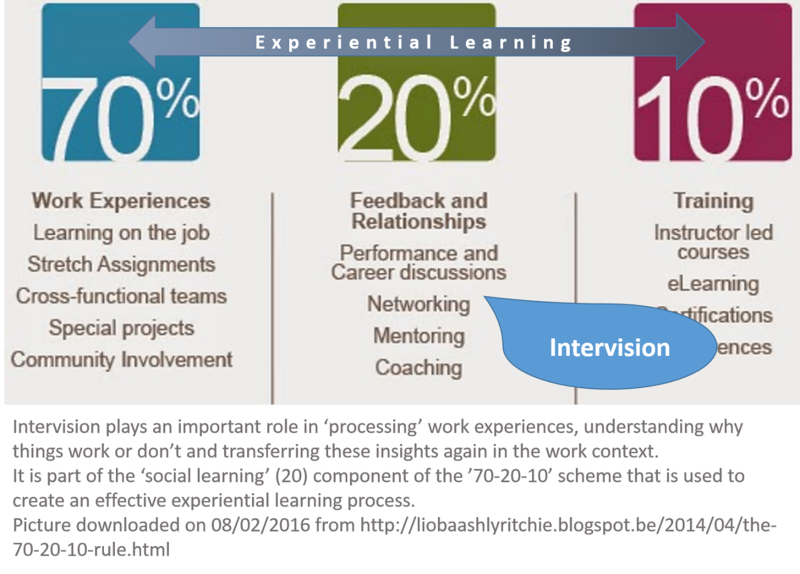 Intervision can play a role at different stages in the experiential learning cycle in order to trigger social learning. 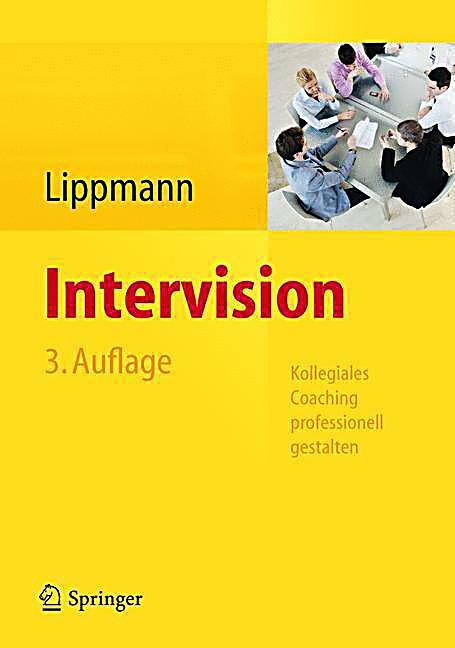 Intervision can be used in between modules of a Learning Track as a way to help learners to apply ideas that came up in the formal training sessions in their work context and it is a way to apply methods and skills they were confronted with during the training. During meetings of professional networks, you could make some room for intervision so that people from different units, sites, countries, etc... can exchange concrete experiences and get some ideas from others on how to deal with that. It is also a way to develop the mutual commitment of the network members. Intervision is a very valuable part on an effective 'onboarding' process of new hires. In Profit & Not for Profit organisations. Specifically in health care, social and cultural organizations and volunteer organizations the technique is already well integrated, but it is possible in all kinds of organizations. Check out this example of United Nations Office on Drugs and Crime. In your team you could use intervision as a 'systematic' moment to learn from each other and deepen the shared purpose of the team throughout different challenges and activities of its members. You could make intervision a fixed part of your team meetings. 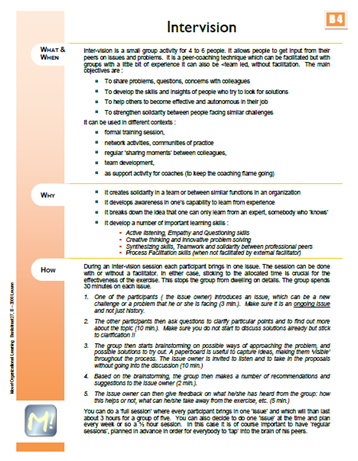 Intervision is particularly suitable as 'peer coaching activity' for mentors, coaches and therapists. Intervision : How can Move! support organizations ? Advice you when launching and implementing intervision and think about how to integrate it in your existing Learning & Develoment practices in your organization. Help beginning intervision groups to work effectively and facilitate their intervision sessions. Develop several formats and activities to use for intervision groups. These videos give you some idea how intervision could look like. We offer this selection of books in multiple languages. If you click on the cover you get a synopsis of the book or a related article. Take care of the composition of intervision groups. Make sure they are sufficiently DIVERSE to make sure there is some creative tension for innovative thinking. At the same time you need to make sure that people have enough in common so they RECOGNIZE each other's issues and they feel close enough to invest in each other's development. In turn that connection and sense of belonging will be actively developed in the intervision process. The choice of topics is also important. Participants need to share 'real issues' they are still working on and for which they do not necessarily know how to move on. As a consequence there is a real need, and the peer advice can be put to practice right away. It's a way to avoid people telling stories about 'what could have been' or starting to judge situations they actually cannot influence any more. The focus needs to be : "what will I do next". The focus needs to be on 'problem solving' and not move into 'who don it' or pointing out what people did wrong in the past, ... It's about coping with new upcoming challenges and get things done and solved. The quality of intervision is very much affected by the ability of people to connect to one another. 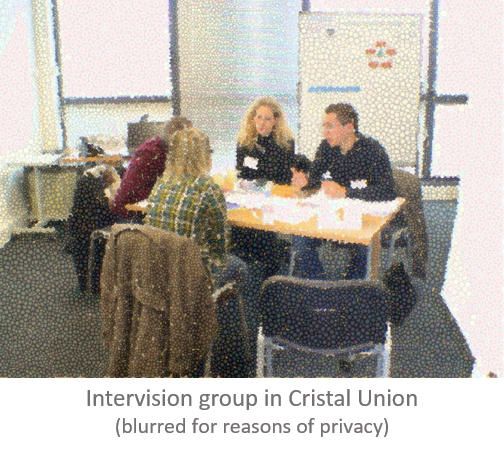 Therefore it is advisable to create 'fixed' intervision groups (always the same group of participants) and to agree to see each other regularly (planned in advance on a fixed moment). That would allow that group to learn 'how to learn' from each other. 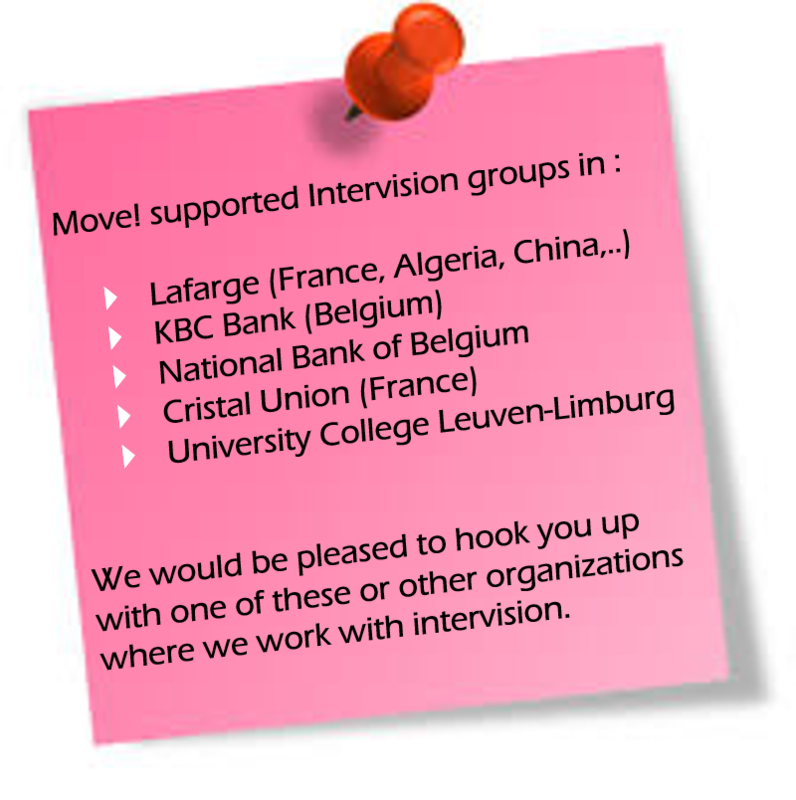 I would recommend to provide a process facilitator for beginning intervision groups. That helps to take a good start and then later in function of the maturity of the group the intervision session can become self managed with the help of a 'job-aid'. 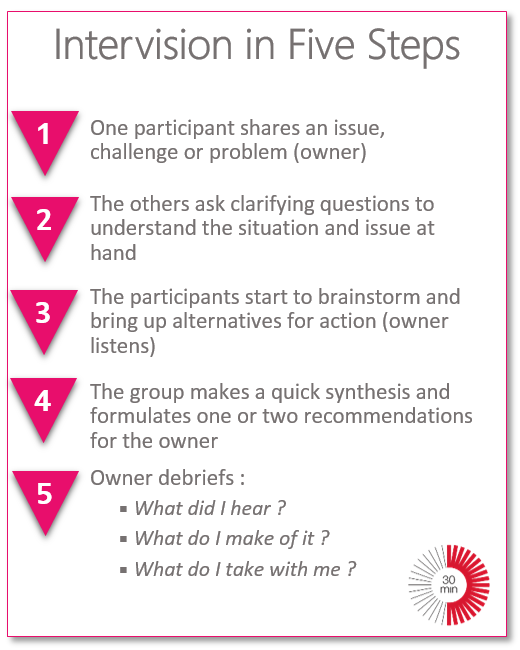 Important is that the facilitator is solely focussing on the intervision process and gears towards autonomy and ownership of the group. It is his role to make himself as soon as possible redundant. How do you know it works ? An important indicator is if people get energy from the intervision sessions. Do people manage to get insight in their own experiences and those of others ? Do they have the confidence to acknowledge the differences and use these differences in vision and opinion as ways to create better solutions ? Do people manage to look at their own situation through the eyes of the other intervision members and does that open new perspectives for action ?